An entertaining and educational parody and board game on redistribution, excess taxes, saved jobs, bailouts, blame, and apology. 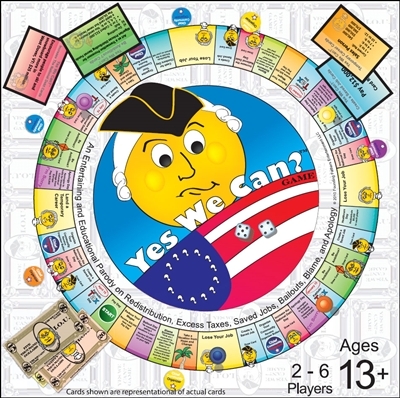 I wanted to play the Yes We Can game after reading some of the sample cards. After getting the game my wife and I and a couple friends opened it up to see what it was all about. The game was very easy to understand and get under way. As we started playing it became clear that we were all getting an education on our government, where our money goes and how scary it is to think that this all happens under our noses. It was a nice change of pace to get facts about our government and the things that happen within it all while having some fun with friends. The good thing about the game is it is not attacking one political party or another it is simply giving you the facts. Since playing the first time we have introduced the game to other friends and relatives who have all come back to tell us how much fun it was and how unbelievable some of the things they learned about our government are. This game is great! I initially bought this game thinking it was a political joke for some members of my family. When we all sat down to play the game, it was actually a very great family game and we were all pleasantly surprised that there were not jabs at Political Parties (It's a game with real world examples). This game is not only fun but also educational. I am a big fan of monopoly, but most family members do not want to play because the game can last several hours, and sometimes days. This game is fast paced, well thought out, and a must have for anyone who enjoys games like monopoly or life. Additionally, seeing how the economy works and the information that you learn just by playing this game is priceless.